When poet, musician, and diarist Jim Carroll died in September 2009, he was putting the finishing touches on a potent work of fiction. The Petting Zoo tells the story of Billy Wolfram, an enigmatic thirty-eight-year-old artist who has become a hot star in the late 1980s New York art scene. As the novel opens, Billy, after viewing a show of Velázquez paintings, is so humbled and awed by their spiritual power that he suffers an emotional breakdown and withdraws to his Chelsea loft. In seclusion, Billy searches for the divine spark in his own work and life. Carroll's novel moves back and forth in time to present emblematic moments from Billy's life (his Irish Catholic upbringing, his teenage escapades, his evolution as an artist and meteoric rise to fame) and sharply etched portraits of the characters who mattered most to him, including his childhood friend Denny MacAbee, now a famous rock musician; his mentor, the unforgettable art dealer Max Bernbaum; and one extraordinary black bird. 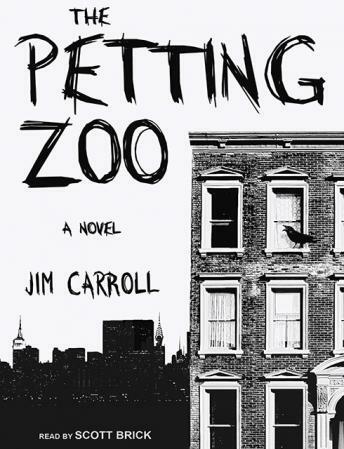 Marked by Carroll's sharp wit, hallucinatory imagery, and street-smart style, The Petting Zoo is a frank, haunting examination of one artist's personal and professional struggles.